Does your organization struggle with lead follow up? Does your sales team have a less than stellar process responding to marketing generated leads? If you’ve answered yes to either of these questions help is on the way. Follow 3 rules to lead follow up to help your company produce a higher number of well qualified leads. The 3 rules to lead follow up are speed, process, and persistence. Let’s analyze these rules to better understand how they support and improve the lead management process. As evidenced by the data, the lead follow up advantage is less significant after the first 2 minutes have passed and greatly decreases after the first hour. It’s undeniable that fast response time drives loyalty. Businesses create strong psychological and social bonds with rapid lead follow up. If the prospect sees sales ultra-attentive to their inquiry and pre-sales interaction with your company it gives them a feel for how they’d be treated once they are a customer. Additionally, fast lead follow up blocks out competing offers as your prospect invests time into a relationship with you, who is the fastest responder. Companies must not think once initial follow up occurs the lead follow up process is complete. In fact, it’s just started. Unfortunately, most sales and marketing teams heavily invest in the first 3-5% of inquiries that have short-term potential. However, sales people who are not aggressive and tenacious may lose interest in continued contact and neglect lead follow up with these 3-5% of inquiries. Then you have the other 95% of leads that don’t have short-term potential, which businesses commonly ignore. Sadly, 70% of those leads will buy from someone. If companies neglect follow up it results in lots of opportunity left on the table. The first thing sales, and marketers, need to do is stop thinking a sale will happen in the first call. B2B buyers do not buy on a whim. A relationship must be built. Lead nurturing technology will automatically send personalized and intelligent communications to your prospects to develop your lead until they’re ready to speak with sales. Put the inquiries not yet ready for sales into a lead nurturing campaign. See our post on Lead Nurturing Programs to get an active of 5 different lead nurturing tracks you can drop your leads into. Concentrate on how buyers buy before you can master how to sell. Buyer’s usually want educational content in smaller, bite-sized chunks, over a period of time. In a similar survey, 15 million sales leads were analyzed. 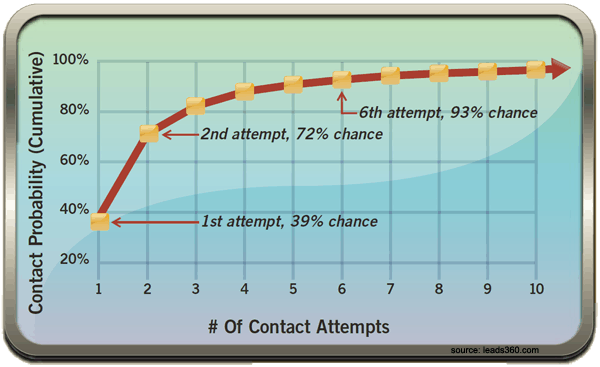 Results showed persistence increased the probability of contacting a lead. The same study revealed a disappointing 50% of leads are never called a second time. When making two calls versus one it increases the chance of contacting a lead by 87%. The report also found six contact attempts resulted in the maximum possible contact rate; however, nearly 60% of sales people made less than sixth contact attempts. • Day 1: call 3 times. The premise is new inquiries should be called immediately and in two subsequent time windows during the first day until contact is made. • If contact has not been made, call on day 3, 4, and day 11 or 12 to maximize contact and conversion rates. • Day 3, call once. • Day 4, call again. • Day 11 or 12, make 2 more call attempts. Realizing the effort to track and schedule lead follow up, businesses can use marketing automation software to automate scheduling of tasks. For example, revenue generation software from Lead Liaison can schedule call follow up tasks and reminders at once. At Lead Liaison we use 6 sales pipeline stages to map the flow of a person through the revenue cycle. Once a lead becomes a Marketing Qualified Lead (MQL) by achieving a particular lead score the lead is handed off to sales. Our system automatically assigns a lead to the sales lead owner and schedules the reminder process in a CRM, such as Salesforce.com. Keeping the 3 rules of lead follow up in mind and leveraging revenue generation software to help deliver lead nurturing and schedule sales lead follow up will help businesses become more efficient in lead management and generate more revenue from marketing dollars. Contact Lead Liaison to better understand how we can help your business with lead follow up. We welcome your feedback, comments and suggestions. What lead follow up tactics have helped you?